Insta360 Nano is now the first 360 camera with realtime image stabilization! And it works! 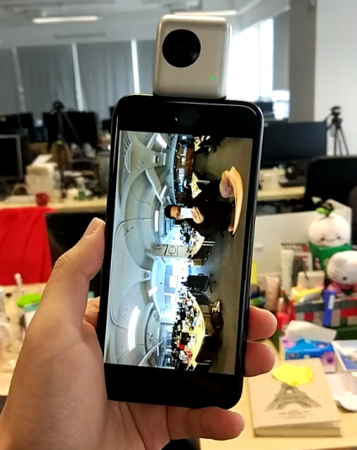 Realtime stabilization has now been added to the Insta360 Nano and it does work! With this feature, the Nano has become the first ever 360 camera at any price and any budget to have realtime image stabilization. 360 videos need to have a level horizon to avoid viewer discomfort (see here for details). 360 videos can be stabilized with a gimbal, or with software in postprocessing. However, Insta360 is using a different approach. A couple of months ago, Insta360 announced that they would add realtime image stabilization to the Nano and the Air. Insta360’s stabilization uses the data from a smartphone’s built-in gyroscope to stabilize the 360 video. Among other things, this makes it possible to stabilize the video in realtime, without any need for postprocessing. This is also an incredibly useful feature for live streaming (where stabilization via post-processing is not an option). Today, Insta360 updated the Nano app to version 1.9 and released firmware version 1.43_0191. These updates enable the Nano to have realtime image stabilization. I tried it out and it does work. You simply insert the Nano on your iPhone and go to the shooting screen, then point the camera to the direction that will be the ‘front’. Then you press a new stabilization button to the left of the shutter to activate stabilization. At that point, the horizon will be leveled automatically. Please note stabilization requires the Nano to be attached to a phone. With the successful implementation of realtime image stabilization, the Insta360 Nano is now my top recommendation for a personal 360 camera. The Nano is available on Amazon or B&H Photo. Meanwhile, Insta360 said realtime image stabilization will be added to the Insta360 Air for Android in a few weeks. Clever idea. Phones have excellent stabilisation via their gyro.